As per the request of fellow Twitterer and pen fan, @MrBill, I am writing about the Parker Latitude line of fountain pens. The cigar shape and iconic arrow clip closely resembles a Parker Sonnet, with one key distinction being the concentric rings around the cap of the pen. The rings provide a sense of modernity and cutting edge style to contrast the classical Duofold and Sonnet collections. As some readers may know, I'm a huge fan of blue, so I picked the Slate Blue to try out. The weight is a bit lighter than your typical Sonnet, probably due to the use of stainless steel for the barrel as opposed to brass that is found in other pens. The chrome-plated trims complement the light blue of the lacquer well. The rings on the cap are a nice subtle accent to the overall design. 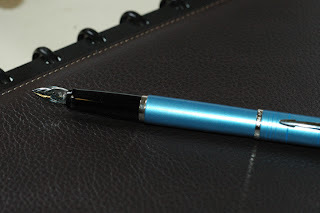 Upon opening up the pen, I notice that the converter is not your typical twist converter, but a slide mechanism, which are also common to the Parker Facets. It certainly seems like the tank in the converter can hold as much as an international-size ink cartridge, which isn't much to crow about. 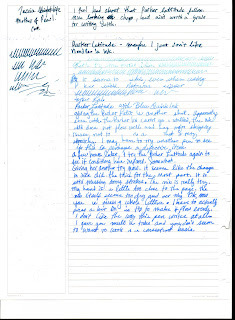 My first complaint came when I was filling the pen with Noodler's Blue/Black ink. I realized that the "sucker hole" or ink intake on this pen is all the way up by the front grip section. I wasn't getting any ink in until I came to the conclusion that the pen's design is going to force me to get messy. I submerge the tip further until ink covered the very end of the front grip area. With getting the air out of the converter and blowing bubbles in the ink, you are talking one messy pen. Some of my notes can seem like Leonardo DaVinci's backward, cryptic handwriting. I assure you it is not my fault. Some words are missing letters because the Parker fell asleep behind the wheel. 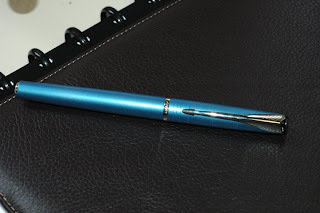 Overall, even with switching to the native Parker ink, the pen worked, but underperformed. There are many pens that are at this price point that perform 10 times better than the Latitude. Parker is said to be releasing a new series by fall. Hopefully, it will be replacing any need for the Latitude. Sorry, Mr. Bill.